As soon as the crab enters the water and starts moving around the lobster sees it, and moves very quickly towards it. The crab, seeing the danger, stops dead, and the lobster stops as well. Eventually the crab moves; so does the lobster. By this time the lobster is over the crab when it stops. The lobster still moves around, knowing the crab is close, and hoping to disturb it and make it move. I have seen the lobster rest its large claw on top of the crab as it lays stationary. Eventually the crab moves and the lobster grabs it, holding it towards its body with the two large claws. It uses its four small claws, one on each of the first and second walking limbs, to grab a leg or a claw of the crab. The crab is helpless and unable to nip the lobster's sensitive body. The lobster can now move the large crushing claw in to position on the body of the crab and with one quick squeeze the crab is crushed. The small claws move the dead crab up to its mouth parts and they start chewing away at the shell using the two grindstone parts of the mouth. Once through the shell the other two parts of the mouth that deal with the soft fleshy material come into use. As soon as the lobster has finished its meal, any food still left is saved for later. The lobster will bury any spare food in the sand, but well away from its home in case a predator locates and homes in on the rotting food. It will not find the lobster, which is really clever. All my lobsters have done this with their food. During darkness, either at night or in deeper waters, the lobster uses its sense of smell to locate food, even from some distance away. Rotting flesh is a great temptation for a lobster, and it will travel some distance for an easy meal. Soft rotting food can be easily and quickly eaten, so it spends the least amount of time in the open, and in danger from predators, as possible. Hence they often end up in a lobster pot because of this weakness. A lobster that has a cave, still digs a deep, long trench outside the entrance. This allows it to move around outside looking for food without being seen or sensed by a predator that might be cruising past due to the high wall of sand between them. The wall of sand also allows fish passing over the wall to become easy prey, as they cannot see the lobster waiting at the bottom of the trench. It can react and move very quickly. Its very long sensitive antennae extend above the wall, and register any contact or touch; it can grab passing fish quite easily. Crabs or other crustaceans that climb over the wall will slide down the steep sides inside to the waiting lobster. It also uses the trench system when caught by daylight in an open sandy area; it can quickly dig a very deep hole by using all its large claws like a bulldozer, and then sits at the bottom. It also does this when danger threatens. All my lobsters have dug trenches or deep holes in the deep sand as soon as they are placed in the tank. Even if I provide them with a nicely constructed tank with a cave, they still move all the sand, gravel and even small rocks around, placing it all up the front or the side of the tank, or wherever they feel threatened. They may change the layout twice a week until they feel safe, like the walls of a castle. Aquarium Study All this behaviour I have seen myself, although only by studying the subject for many hours, and replaying the video tapes again and again can you make any sense of what the animal is doing and why. This is the only way of discovering the fascinating lives of our marine animals. They are not just stupid, and only fit to eat. They are all a very important part of the ecological system of our seas around Britain. The only time most people see the Lobster, Homarus gammarus (L.), is on a fishmonger's stall. It is blue when alive, only turning red after it has been cooked. 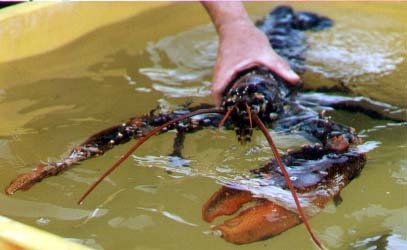 The Lobster is the largest and strongest of our native crustaceans. Undisturbed, its life span may reach 15 years, or more. On rare occasions, specimens can grow to 1.80 metres (6 feet) in length. In pots, the usual size is from between 23 and 38 cm (9 - 15 in), weighing between 0.7 and 2.2 kg (1.5 - 5 lb). Measurement excludes the claws. Lobster fishing is strictly controlled with a licence needed if you capture more than two specimens in one day. The minimum legal size (in Sussex waters) is 85 mm (3.5 inches, carapace length). The length excludes the tail (telson) so the lobster appears much larger. The Lobster has poor eyesight, despite its compound eyes. It spends most of its time out at night, or at depths where there is very little light. Its eyes are secondary to its sensory bristles. These bristles are found all over its body, the claws and legs alone have 50 to 100 thousand. The exoskeleton may be very hard, but the Lobster can feel a grain of sand on its carapace, because of these sensory bristles. The carapace is the head and thorax combined in one very large and strong shield that protects the important organs, with extra thin plates as internal supports for the attachment of muscles. The carapace and the rest of the body is covered with cuticle, which is secreted by the underlying epidermis, which is made particularly hard by an infiltration with calcium salts, from the surrounding sea, during moulting, especially at the ecdysis stage. The exoskeleton consists of 21 segments, 14 combined in the carapace and 7 in the abdomen. The abdomen's cuticle is in folds to allow lots of movement. Each segment has 2 appendages, one on each side. The Lobster is a good example of specialisation among appendages. In the large pincers, one claw becomes larger and fatter, and more solid for crushing. All appendages are powered by large abdominal muscles. 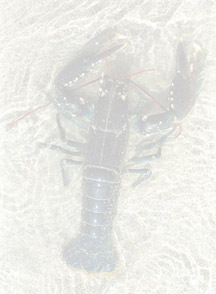 The Lobster may look slow and clumsy, but with its power, it can move very quickly and even catch fish. It will crush open mussels. It can eat almost anything because of its strong jaws. The food travels to the third maxilliped and is shredded well. Once it enters the stomach, it is pulverised by the gizzard, which is lined with hard chitinous teeth. The respiratory surface needed to supply this large and active animal with oxygen is provided by 20 pairs of gills, feathery expansions of the body wall, filled with blood channels. Very little is known about the life of the Lobster in the sea. Any observation from divers and fishermen would be appreciated. Occasionally, adult Lobsters can be found on rocky shores under immovable boulders, and smaller ones in weedy pools. Part 2 of the Lobster article will explore other aspects of its behaviour including the moulting cycle, reproduction and rearing the larvae.